The startup has designed a new product that it says would cut time and labor costs, particularly for commercial systems. Enphase Energy said Tuesday it has developed a new product that puts two microinverters into one package and created a simpler way to wire them together. The Petaluma, Calif.-based company is doing field trials of this new offering, called the D380 TwinPack, and plans to make it available for customers in the first quarter of 2010, said Raghu Belur, vice president of marketing at Enphase. Microinverter technology isn't new, but Enphase, founded in 2005, has put a spotlight on its use for residential and commercial installations. The company, which has shipped about 100,000 microinverters since it began selling them more than a year ago, claims to be the only one selling microinverters today. Most of the solar energy systems installed today use centralized inverters to convert power from direct current to alternating current for use on site or feeding the grid. In this set up, each system sends the electricity it generates to that one inverter, which typically also comes with performance monitoring capabilities. Microinverters are meant to do the same job at the solar panel level. Each solar panel is paired with one microinverter. The company has also developed software to track power output and gather other performance data, which are shown over a web-based display for solar energy system owners. The D380 TwinPack would lead to a different configurations for each solar energy system. Each package has two microinverters, so installers would attach one for every two panels. Each microinverter would still be responsible for converting power from one panel only. 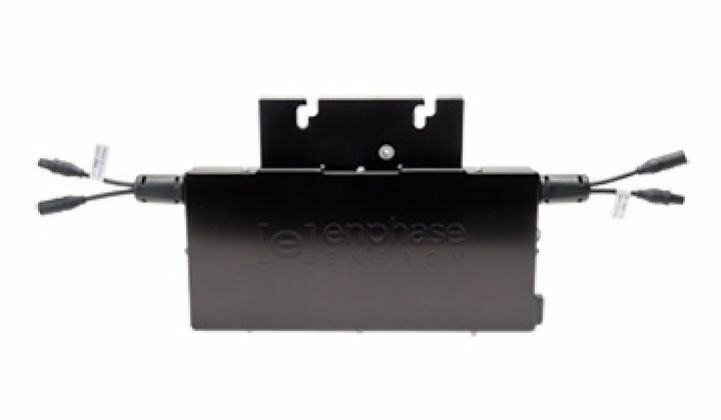 By minimizing the number of devices that need to be connected to the panels, the design simplifies the cabling for the entire system and addresses a key complaint by Enphase's customers, Belur said. "Our customers spend a fair amount of time doing cable management. Our goal is to minimize roof time," Belur said. Enphase said using its new product would cut the number of connections and junction boxes by 33 percent. Reducing the AC junction boxes is significant because each is needed typically for every 6-kilowatt of installation, Belur said. That advantage makes D380 more suitable for commercial installation, though residential systems, which average 4 kilowatts in size, can use it as well, Belur said. Critics have been skeptical about whether microinverters are reliable enough for large installations. Belur said the size of commercial systems that use Enphase's microinverters has become larger: there will be one in hundreds of kilowatts by the end of the year. The company plans to continue to sell the single-inverter product because some roofs have angles and features that require panels to be set apart from one another, he said. The pricing for the D380 would be the same as the single-inverter product, Belur said. Enphase contracts with Flextronics to make its products. Although Enphase got a headstart in the microinverter market, it's facing growing competition. A big threat might come from Germany-based SMA Solar Technology, the world's largest inverter maker. Last month, SMA said it had purchased the microinverter technology from OKE-Services. OKE-Services, based in the Netherlands, had about 15 years of developing and selling microinverters, SMA said (see SMA Solar Enters Microinverter Biz Through Acquisition). OKE-Services sold thousands of them before it sold its intellectual property to SMA. SMA plans to develop its own microinverters using OKE's IP. Incidentally, SMA said yesterday it would build a 1-gigawatt factory in Denver, with production starting in mid 2010. The company plans to make its existing lineup of products at the new, €15 million ($22.3 million) factory. Belur said he's not worried about SMA. "It's late into the game," Belur said. "I treat them like another other startup."